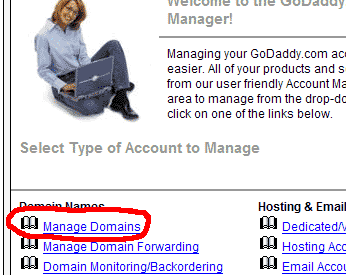 This tutorial shows how you can run your own name servers for domains that you register with GoDaddy. Of course, this works with every other registrar as well, although the procedure might differ a little bit. To do this, you need two servers with two different public IP addresses and with ISPConfig installed, and of course a GoDaddy account. This tutorial is sponsored by Erik Turk of BlueberryNetworks.ca. He gave me access to his two ISPConfig servers as well as to his GoDaddy account so that I could write this howto. ISPConfig server #1: IP address 64.25.171.8; this one will be our primary name server. ISPConfig server #2: IP address 64.25.171.9; this one will be our secondary name server. 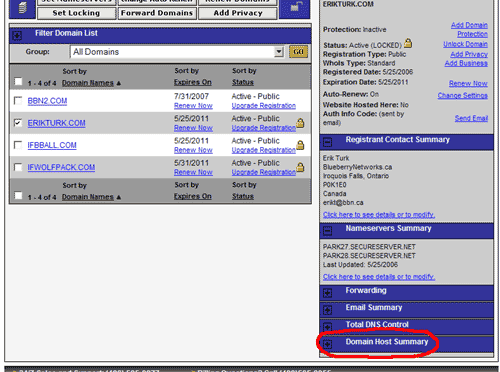 a GoDaddy account with the already registered domains erikturk.com and ifwolfpack.com. Both are currently using GoDaddy's name servers (e.g. park27.secureserver.net and park28.secureserver.net). 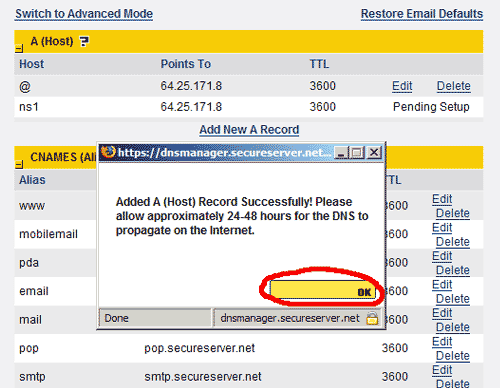 Create DNS records for ns1.erikturk.com and ns2.erikturk.com. ISPConfig server #1 will be ns1.erikturk.com. ISPConfig server #2 will be ns2.erikturk.com. 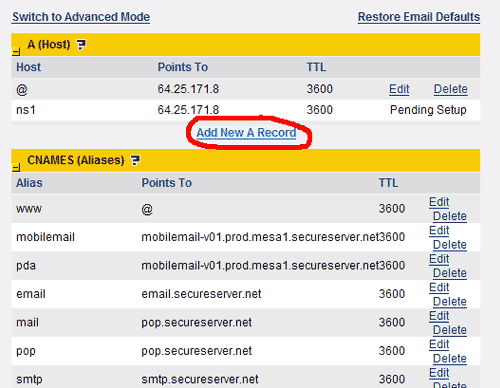 Create DNS records for ifwolfpack.com on ns1.erikturk.com and ns2.erikturk.com. Change ifwolfpack.com's authoritative name servers from Godaddy's name servers to ns1.erikturk.com and ns2.erikturk.com. 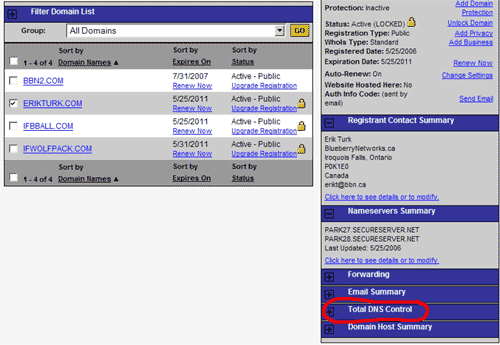 Our domain erikturk.com is already registered, but now we want to create the DNS records ns1.erikturk.com and ns2.erikturk.com that point to our ISPConfig servers #1 and #2. Please note: It is important that your browser allows pop-up windows, otherwise the GoDaddy interface will not work as expected! 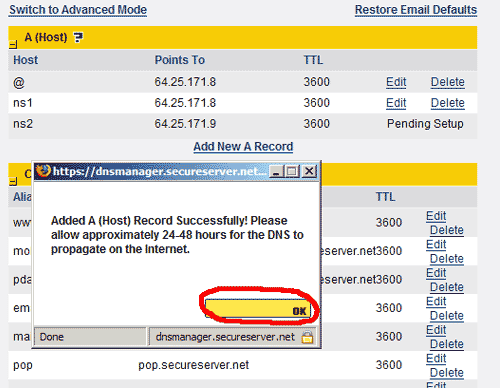 Back on the list of DNS records, a window will pop up saying that it will take approx. 24 - 48 hours until the new DNS record propagates over the internet. 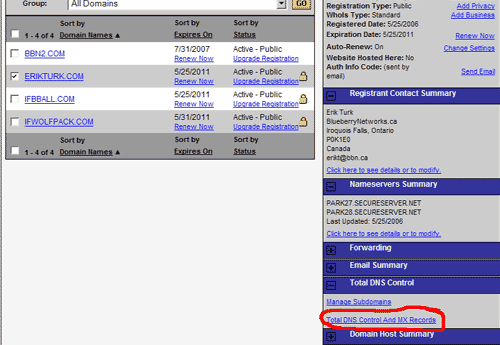 Click on OK.
Our name servers ns1.erikturk.com and ns2.erikturk.com have been created and registered. It takes approx. 24 - 48 hours until our changes propagate over the internet, but normally it works the next day. You should wait until then before you proceed. Please note: the steps from this chapter have to be done only once. 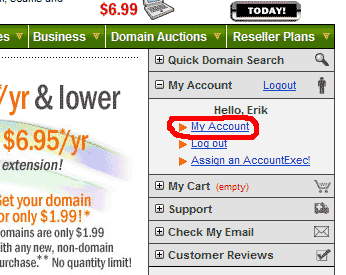 You don't have to do them again if you want to use ns1.erikturk.com and ns2.erikturk.com for other domains than ifwolfpack.com, too. Godaddy changes the interface nearly every day, half the time I cannot see the Login area, but the principles stay the same, forget that, if anyone figures out Apache James with a dynamic IP or DynDns you got money! 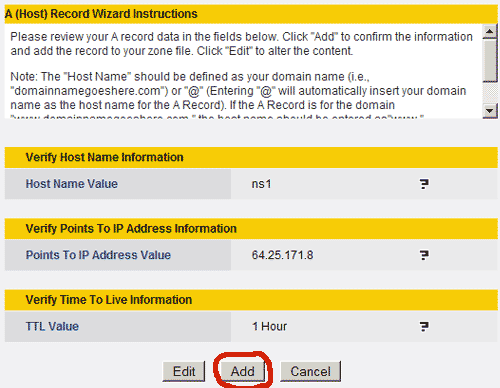 the ip adress in godaddy is the internal ip or the router ip ? Isn't it enough to add the Own Name Servers in the Host Summary ? 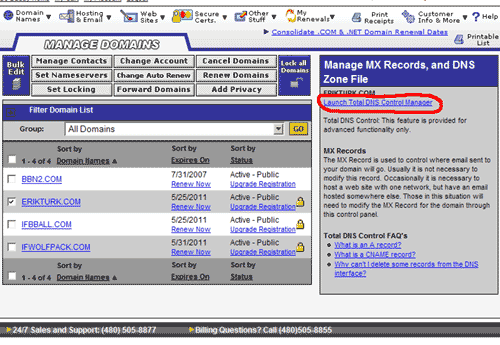 Do Own Name Servers need to be added as A Records in Total DNS Control as well ? 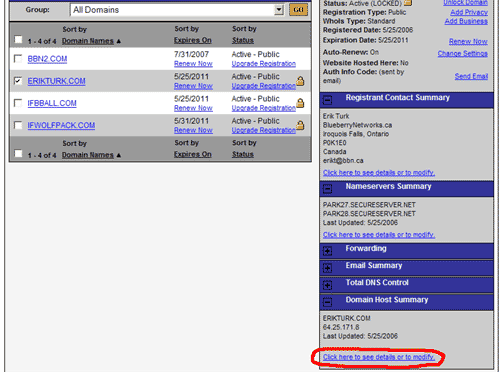 What is the point of even having your DNS servers if you still need to register ifwolfpack.com with godaddy? I would think just registering your DNS servers with godaddy and registering ifwolfpack.com with your own DNS servers would be good enough. The whole point of having your own DNS server is to register domains with your DNS server and with no one else's. So you are still using godaddy are the DNS server if you need to register the domain with them, pointing to your own DNS server, and re-registering the domain with your own DNS servers. 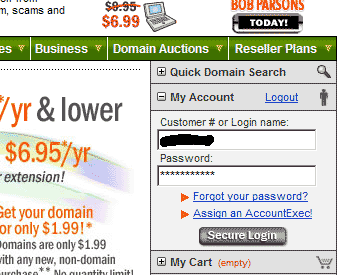 It defeats the purpose, and you still endup having to pay for two domains and not just one. 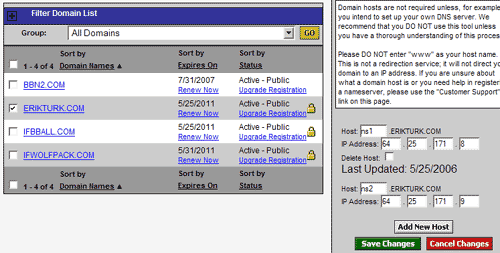 Just use godaddy as your DNS server, and just point each domain you register anyways with godaddy to your web server. If you are like using IIS with like windows server, each website has a host header name to identify what domain was visited and the correct website appears even do all domains point to the same webserver ip address. I wish some one would show us or tell us what steps need to be taken to have our own DNS servers, we register the DNS servers on the internet prob with the ROOT server(s), and after that all the domains we would want would just be registered on our own DNS servers, and no one elses. There has to be a way to pay for one domain, and have all other domains you want on your own servers and accessed from any place in the world, instead of paying for each domain. How does it actualy all work, you go the ROOT server . Are all websites in the entire world registered on every DNS server in the world, I don't think so, it's registered in at least 1 or 2 DNS servers only, that's it. This helped a lot, thanks! The screenshots can be updated, but still easy to understand (even better than a lot of Co-Lo and Datacenters Troubleshooting pages lol. 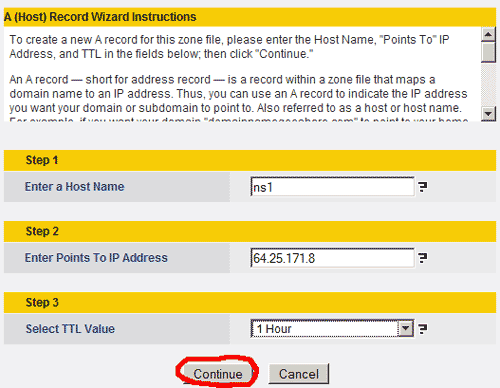 What if i have only one ip address? 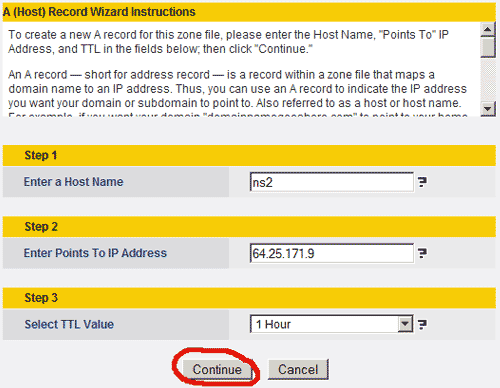 Can i use same ip address for ns1 and ns2? 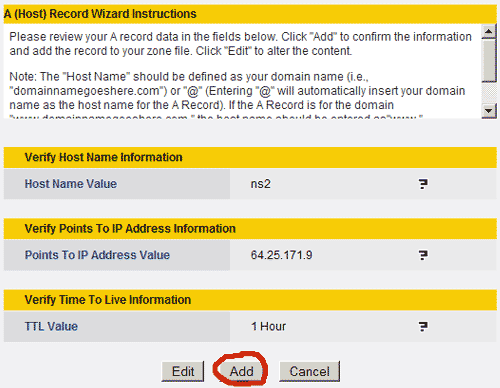 If not how can i get my second ip address? Should i setup other ispconfig panel? Actually i am new into server. I just setup ispconfig on google cloud. So your awnser will be highly appreciated.